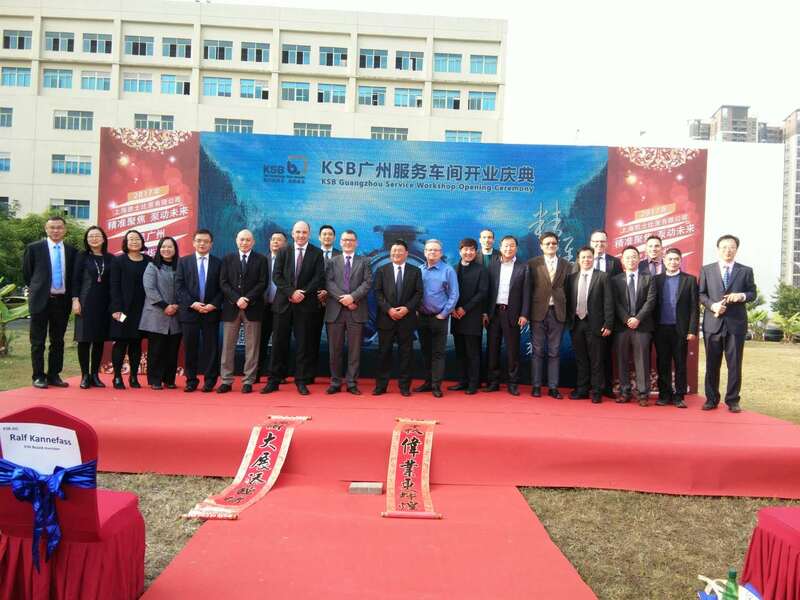 On December 12, 2017, the opening ceremony of KSB Shanghai Pump Co. Ltd. Guangzhou Second Branch (Guangzhou Service Workshop) was held as scheduled. Guests from KSB Germany Headquarter, KSB Hongkong, KSB Taiwan, KSB Korea, KSB Dalian Valves, KSB Tianjin, KSB Changzhou Valves and clients, came to Guangzhou Service Workshop together to participate in and witness this celebration. At the ceremony, Yao Mengxing, GM of KSB Shanghai, delivered a welcome speech, and Mr. Ralf Kannefass, Director of KSB Germany, Dr. Garbe, Executive Officer for Global Service of KSB, Mr. Zhu Yonghuan, CEO of KSB North Asia and client representatives also made their enthusiastic speeches respectively. As a service base in South China, Guangzhou Service Workshop has a total investment of about 7 million yuan, with a set of first-class equipment, facilities and technicians. Based on the strategic planning of KSB Group, Guangzhou Service Workshop, following Shanghai Service Workshop and Tianjin Service Workshop, is the third one established in China for KSB’s extension of service outlets. From the initial planning (in April 2017) to the layout design, from the construction to debugging and operation (in October), and then from the commissioning to today's opening, the workshop has attracted concerns and gained supports form the Group leaders, especially the concerns and greetings from the surrounding customers, which is a great encouragement and support to the business development of KSB in Southern China. We always focus on our customers and respond positively to customer needs to further improve service response speed. Guangzhou Service Workshop involves after-sale service of energy, water and sewage, and industrial products, with its operations covering Guangdong, Guangxi, Fujian, Hunan and Hainan (a total of 5 provinces). Meanwhile, it also supports the orders from Hong Kong and Macao.